You may have seen the news today that Amazon are working on a drone delivery system (over at TechDigest, we’re not so sure about it ourselves). Whilst Amazon reckon they’ll have their system ready for 2015, there’s a new drone that you can buy today for yourself – the Parrot AR 2.0. Why would you want a drone? Not only are they great fun, and would make an incredible Christmas gift (who’s going to be disappointed with a DRONE?!) – but they can do all sorts of cool stuff too. The Parrots that have launched today are special too – because they come in camouflage. That’s right – whether you’re tracking bad guys in the jungle, snow or the sand – there are three relevant designs available. Though we’re assured by the manufacturers that the drones will still fly in your local park – no monkeys, igloos or yurts required. So what can the drones do? They’re radio controlled and are controlled through an app for your smartphone (Android or iPhone). Here you can adjust height, move it around – and even tell it to do a flip. Apparently the app also has built in sharing functionality too – so you can share photos and videos with friends, and the wider drone-using community. As for the actual drone hardware: There’s a built in HD camera – that runs at 1280×720 (720p) – which you can monitor in real time through the app – and crucially, it’ll keep itself stabilised. There’s also a built in battery that after charging will apparently give you 12 minutes flight time – which might not sound like a lot, but even the top-end consumer drones are stuck at around 20 minutes at the moment. If Obama is reading then sorry – no missiles on this model! You’ll have to look elsewhere if you want to carry out an extra-judicial aerial killing. 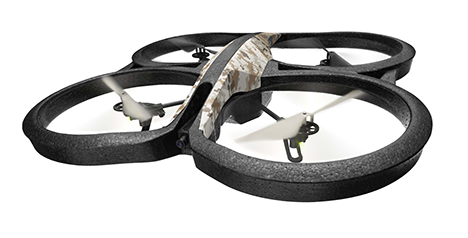 If you would like a Parrot though – you can pick one of the new camouflaged models up for £279.99.